Robert Tomes was born and raised in the "Windy City" of Chicago where tight loops are a definite requirement. He got his first taste of fly fishing as a kid, casting a line along the Lake Michigan shoreline for panfish, trout and salmon. From there he embarked on an enviable 30 year career that's included teaching casting and tying at one of the first fly shops in the Chicagoland area, guiding for big bows, kings, char and grayling in the Alaskan wilderness, speaking and giving seminars at major fly shows, television and radio appearances on fishing programs around the Midwest, and regular writing and photography assignments for some of the leading fly fishing publications in the country. Robert is also the long-time Midwest Regional Editor of Fly Fish America magazine. 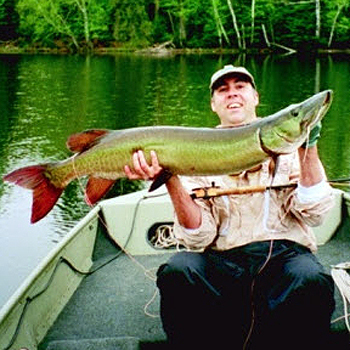 Muskie on the fly? You've got to be kidding! Robert Tomes isn't kidding at all in fact you'll learn exactly how to hook up with one of these aggressive predators on the show. Robert demystifies the Muskie and will tell you why fly fishing for Muskie might be an even better option than throwing big plugs at them. His passion for freshwater and saltwater fly fishing has also taken him around the world in search of great fishing opportunities and unique species with regular excursions to the Florida Keys, Bahamas, New Zealand, Australia, Central America, Patagonia, Canada, Europe, and even Japan. Among many freshwater species, the legendary muskellunge - fish of 10,000 casts - captured Robert's attention at an early age. So much so that he's spent a lifetime pursing - and catching - this elusive predator around North America with only a fly rod and a feathered hook. Widely considered the expert on this arcane subject, he recently authored the first book ever published on fly fishing for muskie, Muskie on the Fly (Wild River Press.) This comprehensive, full-color, and lavishly illustrated book is a must have for anyone serious about chasing this coveted and exciting gamefish on a fly. You can order Robert's book at www.WildRiverPress.com.